Go On - Grow Some Grasses! Ornamental grasses are wonderful foliage plants, and I've been growing them for ages. 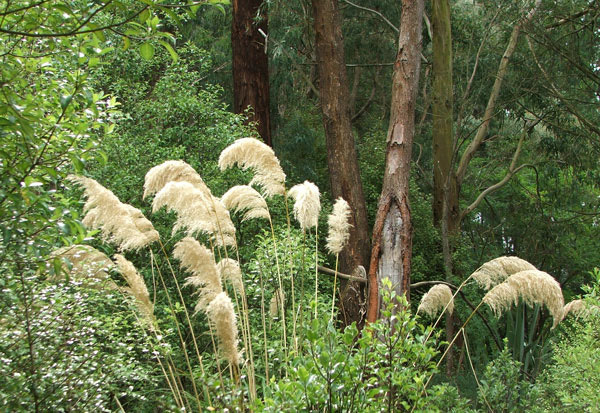 And so I should be - New Zealand has some wonderful smaller tussock grasses in its natural spaces, as well as larger specimen grasses with wonderful seed heads. Tussock and scree gardens became horribly popular for urban lazy-bones gardeners in the 1980s. Those of us with souls refused to be so small-minded and sterile, having just discovered the fluffy English Cottage garden look. Now (in 2010) rounded river stones have become the garden designer's plaything, providing such an easy (and unimaginative?) textural contrast for grasses. Large tussock swathes in round river stones are now de rigeur for local council landscaping, road frontages of new country houses, and front yard in town apartments. New Zealand is a naturally grassy country anyway. Several native Carex varieties come and go in my garden - shining rusty reds, dead-looking browns, and golden yellows. I am well provided with Carex offspring - particularly in my vegetable garden where a long stalked brown tussock is a particularly keen parent. How terribly useful! In late summer, seed heads of the New Zealand native Anemanthele lessoniana (a fountain shaped larger grass) drape themselves like strands of a million cobwebs. The look is quite magical, particularly when there's been a morning dew. I grow a lot of this grass, preferring to plant it in gentle curves. There are always plenty of self-sown seedlings to pot up for the next big planting plan, too. A special small grass which grows in my garden and always grabs my attention in spring is Bowles Golden Grass. Seedlings pop up here and there, but it's never been a nuisance. I bought one pot of it for fifty cents at a nursery sale years ago. 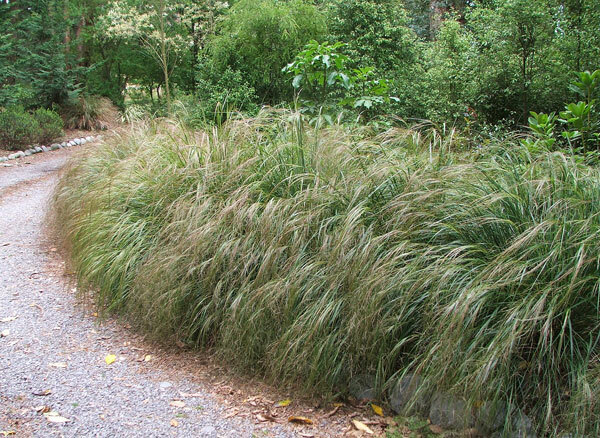 Other ornamental non-native grasses I've bought from nurseries include different varieties of Miscanthus and Calamagrostis. One grass that I'm not allowed to grow is Pennisetum, so naturally I think it is the most incredibly beautiful plant in the gardening world, and I want some. It's definitely a case of 'The grass is greener...' (or more purple, in the case of Pennisetum). Finally, a word for the colour conscious. Grasses are definitely not just green. 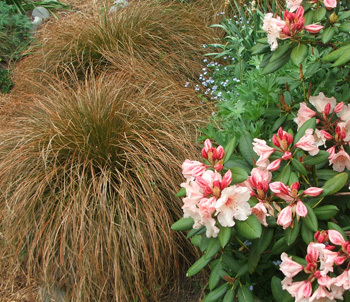 You'll find a huge range of shades - golds, russets, cool blues, rich tans and browns, even rose pinks and reds. 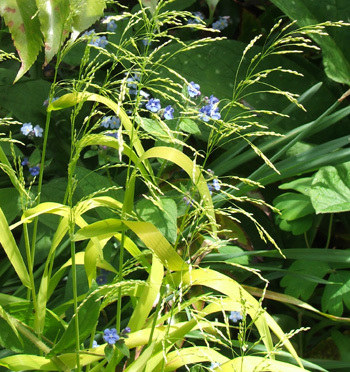 Grasses are wonderful foliage plants - go on! Grow some!